There are lots of ways of creating fire breaks, but the fastest and best is with a tractor. For the small prairie remnants that we burn here in southern Wisconsin, the breaks don't need to be real wide, and a small Kubota tractor is ideal. I'm not talking about a 50-100 horsepower tractor, but one of the small ones sold for use around small "estates". The one we have is about 18 HP. We have owned our Kubota for about six years and it has served us very well. Although it has a PTO and 3-point hitch, suitable for use with a small brush mower, for prairie and savanna fire breaks, the under deck mower works well and is very easy to use. No fussing around hooking up the brush hog. Just climb aboard and start mowing. 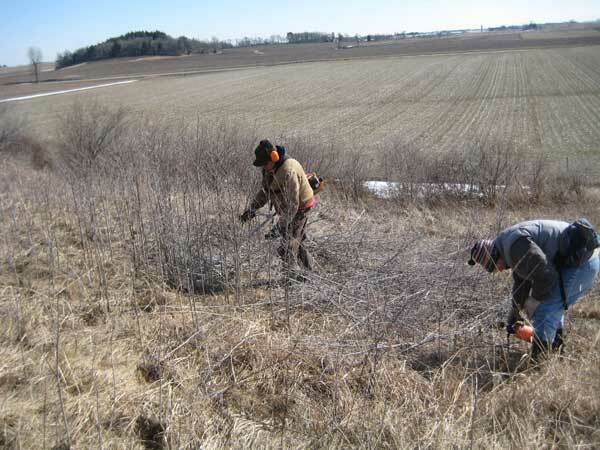 The photo shows Kathie "touching up" a fire break at Black Earth Rettenmund Prairie, one of the prime Prairie Enthusiasts preserves. She had mowed the fire breaks late last fall but since we are burning tomorrow, another pass today made good sense. The impressive thing about our Kubota is that it is able to handle even small brush. I know a lot of people mow fire breaks with walk-behind mowers such as the DR or Ferris. These are a lot cheaper, and just as effective, but on the kinds of hills we have to deal with, the operator needs to be young and strong. On the other hand, even an 80-year old in reasonable shape can operate a Kubota. 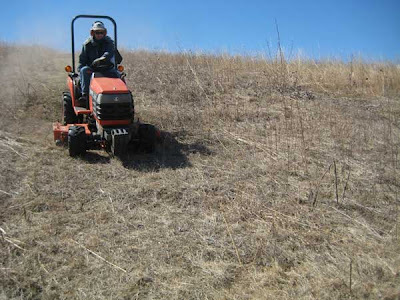 In addition to fire breaks, we use the Kubota to mow hiking and ATV trails; only two passes (over and back) are needed. And when you are all finished with your prairie work, you can use it to mow your lawn! Winter seems to keep hanging on this year, which is bad for burns but good for brush work. Yesterday a group of Madison Audubon volunteers worked at Arlington Prairie, a small but high quality remnant in the Goose Pond area. The photo shows Mark cutting a gray dogwood clone and Susan (plus others out of the photo) following along after and treating all the cut stems with Garlon. The Stihl brush cutter is the ideal way of handling this sort of small brush. In addition to gray dogwood, there was honeysuckle, wild plum, and hawthorne. Most of the brush was small. This 5 acre prairie remnant, completely surrounded by ag fields, was too rocky to plow and too small to graze, and hence remained intact. It has a lot of fine prairie species, including large populations of prairie dropseed, rough blazing star, silky aster, rattlesnake master, and the colorful downy gentian. Also present is a small population of Prenanthes racemosa, a relatively rare, high C-value plant (C = 9). The day started cold but warmed up to the low 30s by lunch time. Fortunately, we were on the south side of the ridge and the wind was out of the north. Oak grubs are small trees with multiple stems. They arise from oak seedlings whose tops are killed by fire. Oaks are uniquely adapted to fire and grubs may remain alive for many years without turning into saplings. According to Johnson et al. 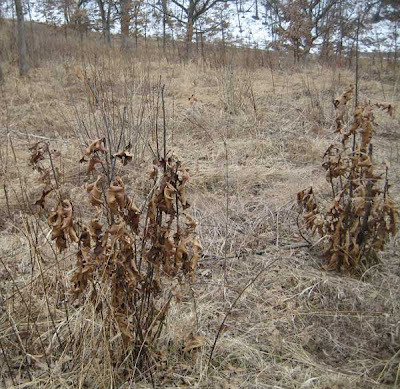 (Ecology and silviculture of oaks, 2009, CAB International) these small grubs may have large root systems that are many years older than their living stems. As it turns out, this is a good time of year to spot oak grubs, especially in the savannas where there is a lot of open area. The photo above shows some black oak grubs (Quercus velutina) in Unit 12A. These are interesting because all of the saplings and large trees in this savanna are white oaks, yet all the grubs are black oaks. This species is a fairly weedy tree which thrives well in sandy areas, such as present in this particular unit. Without moving I counted at least a dozen grubs. In an open area like this, where prairie grasses also thrive, there is plenty of fuel for hot fires. What would happen if the burns ceased? Since they have extensive root systems, all of these grubs would quickly turn into substantial trees. In a sense, they are just sitting there waiting for a chance to start growing. Here is another possibility: due to weather conditions or other random events, one of these grubs might miss getting burned. If this happens, it will quickly turn into a small tree. Because of the big root system, it should send up a fire-resistant (because of the corky bark) trunk. In fact, near these bur oak grubs there is a small tree that has escaped fire. This tree is very close to Pleasant Valley Road, where prairie grass is not too well established, probably explaining why it is no longer a grub. I noticed that there were lots more grubs in the open than in the closed savannas. Since oaks are not very shade tolerant, this makes sense. Anyone interested in details of the ecology of oaks should check out the text by Johnson, which is an authoritative and very complete up-to-date reference book. Today was the first day in months that I have been able to get to the top of the ridge. The last week of sunny (although cold) weather was responsible for a lot of snow melt, and although we still aren't completely snow-free, our south-facing slope and ridge-top savannas are now bare. Both the pickup truck and the Kawasaki Mule started, even though they had been sitting completely idle since early December. Although our woods road was still mostly ice, and not accessible, the trail up through the White Oak Savanna was open. Once on top, I went to the Far Overlook to check on the beavers. Darn! They were still there. 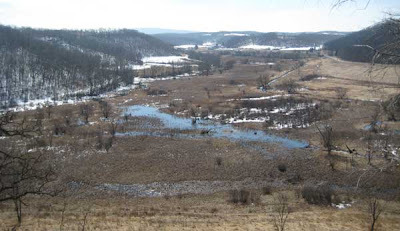 The photo here is a little distant, but you should be able to see two beaver dams blocking Pleasant Valley Creek. I'm not sure what the long-term effect on the wetland will be, but it's giving the ducks and geese paddling water. Also, there was a cluster of perhaps six sandhill cranes that were creating quite a noise. 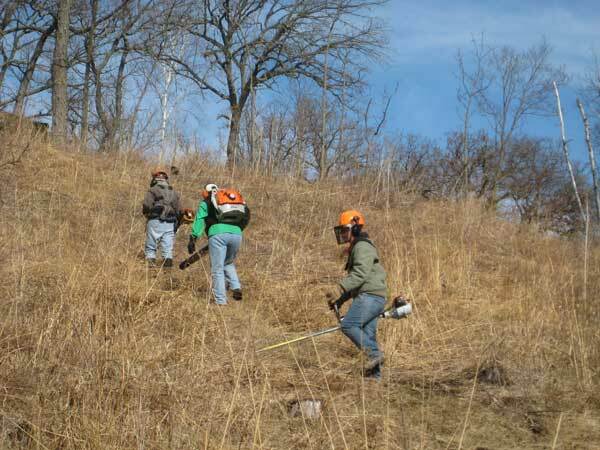 The main work today was clearing fire breaks at both ends of the south-facing slope. By now, we have this down to a routine. The photo shows Susan, Marci, and Amanda clearing the break up the east end of the south slope. Two brush cutters and a leaf blower make fairly short work of the job. They go up to the top, and then widen further on the way back down. Another job using the same equipment is clearing the bases of standing dead snags. This saves a lot of potential problems during mop-up after the burn. 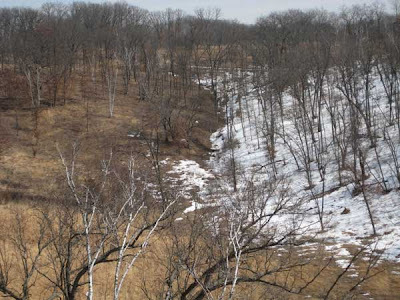 I have always been interested in microclimate effects, and the photo below shows in dramatic fashion the difference between a north- and south-facing slope. The ecologist or forester uses the term "aspect" to refer to the direction a slope is facing. The area on the right (Unit 20) has a north aspect and is fairly closed woods (hickory, basswood, birch, a few maples), whereas the area to the left (Unit 12A) has a south aspect and is white oak savanna. The ravine between these two units is narrower than it seems on the photo, and the steep sides enhance the aspect effect. Not surprisingly, the vegetation on these two slopes is quite different. Also, they burn differently. Not too early to spray bad green stuff? Some of the south- and west-facing woods are essentially snow-free, and are starting to show patches of green. Everything that I have seen has been bad, nonnatives that are probably left over from late fall growth and have been overwintering under the snow. The photos here are from Reese Woods in Shorewood Hills, but could probably be found in lots of other places. 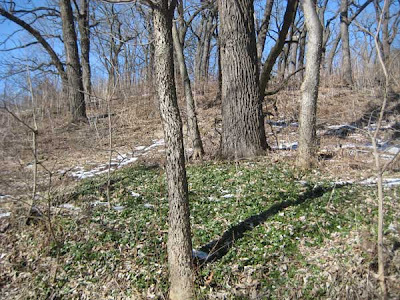 The big patch in the photo above is Vinca minor, which is probably only a "minor" problem. 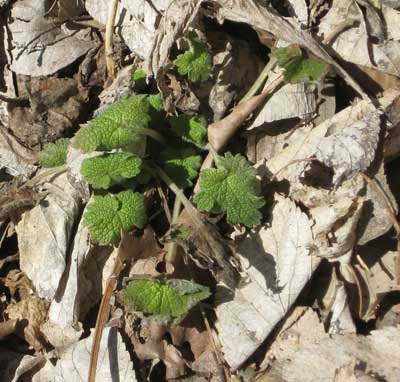 But the photo to the left is motherwort (Leonurus cardiaca), a nonnative that is fairly widespread in southern Wisconsin and worth getting rid of. I've seen this in lots of disturbed places at Pleasant Valley Conservancy, such as road cuts and edges of parking spots. 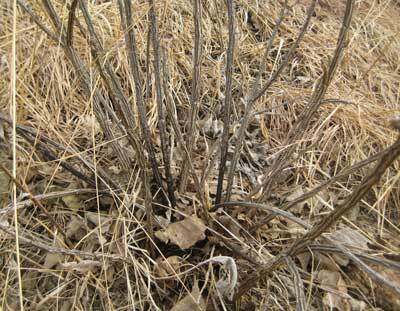 It is a perennial, and hence can only be reliably eradicated with herbicide. We had lots of this in the areas cleared in the East Basin, and spent quite a bit of time before planting spot spraying with glyphosate. Right now it is really easy to spot, because there are few other green things (and those that are present are probably also nonnatives). The ideal time to spray, as there is nothing "good" yet, so that anything green is bad. However, there is a narrow spray window now, because in a couple of weeks some good species, will start to show up such as early buttercup. Never pass up a chance to spray when the conditions are favorable.